The siren sounds with Carlton kicking 6.6 to a scoreless GWS to run out 67 point victors. GOAL BLUESScotland wins the ball from Power and handballs to Garlett who bends it around his body for another goal to the Blues. GOAL BLUESHampson kicks to Walker who marks on the 50. His kick for goal just has the carry to get there. Walker has 3 goals and the Blues have 14 and lead by 61 points. BEHIND BLUESGarlett tries to kick a bouncing goal from the pocket, but it bounces the wrong way. BEHIND BLUESBetts marks in the pocket but he still isn't able to score the elusive goal in his 150th match. The Blues fans are loving Bootsma with his curly blond hair and skinny frame. BEHIND BLUESTwo rushed behinds for the Blues with the Giants run off their feet to take the lead out to 53 points. GOAL BLUESEllard handballs to Hampson who runs to 50 and goes BANG! He has kicked his third goal and the Blues are running away with it. BEHIND BLUESWalker marks it just inside 50. He goes through his routine before starting the kick left and leaving it there. Carlton are now doubling the GWS score. Scully has been quiet with just the 12 disposals. 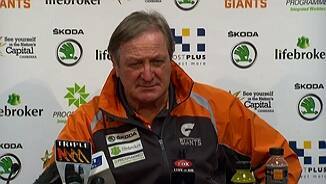 GWS need to lift in this final quarter because they do not want to be blown away. GOAL BLUESHampson takes it through the hands of Sam Reid, then he turns on a 5 cent coin and kicks the goal. He made that look easy. Blues lead by 44 points. BEHIND BLUESSome quick ball movement sees Simpson in prime position and he takes the mark. The kick by Simpson is very poor. GOAL BLUESBets looks for Simpson with a centering kick off the outside of his boot. Simpson marks and slams it through from 13 metres out. GOAL BLUESWalker kicks to Thornton who edges out his opponent to mark. Thornton slots it through and the Blues lead by 31 points. The Blues have made their sub at three quarter time with Henderson making way for Bootsma. 3/4 time: The Giants remained competitive that term but the Blues won the contest on the scoreboard & are now 25 points in front at the final change. GOAL BLUESThe Blues win the clearance & the short kick finds Thornton who takes the diving chest mark, he lines up 45 out & gets a handy goal for the Blues just before the final break. Giles has come off the ground for the blood rule, the Giants do not have a ruckman left on the ground to contest at this contest as a result Hampson wins it easily. Despite being outscored this term the Giants continue to apply pressure on the Blues & are making the Blues work for every possession. BEHIND BLUESRobinson has the goals in sight as he unloads from 45 on a slight angle, it's an ugly kick off the boot & it bounces to the left of the post. BEHIND BLUESSimpson receives the ball in the middle of the ground, there is no one up forward for the Blues, he has a couple of bounces runs to 48, unloads but sprays the kick to the right. BEHIND GIANTSGreene has a snap from the left pocket but his kick misses to the near side. The Giants will have their work cut out for them now that O'hAilpin has come off the ground, earlier the Giants had to activate their sub Reid for Brogan who has sustained a wrist injury. BEHIND BLUESMurphy gathers & has a shot from 35 out just inside the boundary, it's a beautiful kick but it shaves the inside of the post. Despite the fact that O'hAilpin is being chaired off the ground play is continuing around him. O'hAilpin lands awkwardly in the contest & Kruezer's weight goes down on O'hAilpin's knee. O'hAilpin cannot move & has to be carried off as he cannot put any pressure on his left knee. BEHIND GIANTSSmith has a snap 30 out but his kick misses to the near side, the Giants trail by 16 points. GOAL GIANTSScully spots Davis alone & he takes the grab 35 out, he lines up on a slight angle & gets one back for the Giants as he drills it. BEHIND BLUESBetts danceson the boundary line, he has a bounce as he gets around Kennedy & snaps from deep in the forward pocket, the kick looks good but he narrowly misses. Jamison is under pressure in defence but he combines with Scotland & the Blues weave their way out of trouble. With 2 quick goals the Blues have opened up a 22 point lead. GOAL BLUESBower takes the grab 45 out, he goes over the top to Robinson who has space & takes it 30 out, he lines up on a 45 degree angle & threads it through! The Giants are winning the ball at the stoppages, they have had 28 clearances to Carlton's 20 but the Blues are starting to get more of the ball this term & are winning the contested ball. Giles, off the ground kicks the ball forward but it's cut off by Gibbs & the Blues move it down the ground. GOAL BLUESIt's a high kick by Bower & Hampson takes the easy uncontested grab, he lines up 35 out on a slight angle & he threads it through in his 50th career match. BEHIND GIANTSO'hAilpin ducks his head & wins the free for the high tackle, he lines up 40 out on a 45 degree angle, the kick looks good off the boot but he just misses to the near side. BEHIND BLUESGarlett takes the grab & lines up 35 out just inside the boundary line, he goes back but the ball slams into the wood work! Jospeh kicks it deep inside 50 looking for Garlett but Mohr is in front & takes the easy chest mark. The teams return from the main break & the Giants takes the ball away from the middle. HalfTime: The Giants are taking it up to the Blues, they broke even that term & trail by just 10 points. The Blues are walking off the ground to the sounds of boos from their supporters. Carlton's work rate is questionable at the moment, the Giants are working harder to win the footy & have been taking more chances. Garlett sends a long high ball towards Walker, he has 2 to beat & Mohr punches it over the line for a throw in. GOAL GIANTSSumner can't complete the grab but he recovers & takes possession 35 out, he chips it to Davis but the kick is too long, he runs onto it & chips goalward & it dribbles through! BEHIND BLUESThe ball is bounced 15 out from Carlton's goal, no one can take clean possession & it is punched through for a rushed behind. BEHIND GIANTSConiglio lines up 48 out on a slight angle but his kick just misses to the right, the Giants have had their opportunities this term, they needed that one to stay with the Blues. The Blues have regained some composure & have made the Giants pay for their turnovers, they lead by 16 points. GOAL BLUESBower intercepts the ball at half back, he has no one ahead of him as he dashes through the corridor, he runs to 45 & unloads with a driving kick & sails it over the goal umpire's head! McDonald is doing a great job on Robinson, he has kept him to just 3 disposals whilst picking up 14 disposals & 2 shots on goal. BEHIND GIANTSThe ball is thrown in 40 out from the Giants' goal, Scully wins the ball from the stoppage & gets it out to McDonald who snaps from 35 but his kick just misses to the near side. Greene has another shot on goal as he snaps from 40 but his kick goes out of play for a thrown in. BEHIND GIANTSGreene unloads from just outside 50, it's a big kick for a small bloke but he just sprays it to the left. 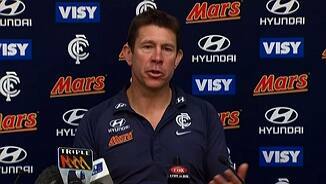 Carlton have won the last 2 centre clearances & have turned them into goals. GOAL BLUESRobinson sends the long ball inside 50, Lucas flies & takes the grab, he lines up 20 out on the slightest of angles & gives the Blues a 2 goal buffer. GOAL BLUESArmfield is under pressure in the forward pocket, he gets the short kick away & Thornton takes the grab 25 out directly in front, he lines up & makes no mistake of it! GOAL GIANTSPalmer sends the ball inside 50 & Scully outmuscles his opponent to take the grab 30 out, he lines up, splits the middle & the scores are level! BEHIND BLUESDuigan has a shot from 30 out but he sprays the kick to the left. The Blues have had 20 inside 50s, 10 scoring shots but only managed 3 goals. GWS are winning plenty of the ball but it is coming unstuck for them at half forward. BEHIND BLUESThe Blues win the ball out of the middle & are quick inside 50, Gibbs has a snap but it's a poor kick off the boot & he sprays it, another easy miss by the Blues. It's just a 4 point ball game, O'hAilpin has 2 goals against his former club & the Blues have their work cut out for them. GOAL GIANTSMcDonald picks up the loose ball, he handballs it to O'hAilpin who goes for the traditional torp from 48 out, it bounces on the last line & bounces through! The second term is underway, the Blues lead by 10 points & will be looking to make amends for their opening term. 1/4 time: The Blues were physical that term & had plenty of opportunities inside 50 but were wasteful in front of goal & find themselves just 10 points up. Credit to the Giants who have started well. GOAL GINATSO'hAilpin will line up 35 out on the slightest of angles after the siren, there's plenty of Blues around the stadium as he unloads... & threads it through against his former team! BEHIND BLUESJamison has found himself up forward & he snaps a shot on goal but his kick is offline, the Blues lead by 16 points. Brogan has come from the field with a suspected broken wrist. The Giants have done well to keep up with the Blues, they have been playing man on man & are restricting the Blues' run. The Giants work the ball into attack, the ball comes inside 50 but Walker flies & takes one of his trademark grabs & bombs the ball out of defence. GOAL GIANTSGWS go coast to coast as they run the ball through the corridor, Sumners takes the grab out in front 45 out, he lines up & in his debut match threads it through! BEHIND BLUESThe ball spills free to Walker, he's just 25 out from goal & in the end he is under pressure & forced to hurry the kick & the ball misses to the left. BEHIND BLUESTuohy with pace runs it forward, he sends it inside 50 & Kruezer stands tall in the pack & takes a great contested grab, he lines up 30 out on a slight angle but sprays the kick. The Giants have had 6 inside 50s for just the single behind. BEHIND GIANTSThe ball is thrown in 20 out, McDonald swoops on the ball & has a hurried snap but he misses to the left. Brogan receives the free from being held in the ruck contest, he lines up 35 out on a 45 degree angle but he sprays the kick across the face & it goes out for a throw in. GOAL BLUESBetts drops the mark but quickly recovers off the ground, he handballs it out to the running Lucas, he has a shot from 30 out & splits the middle, Blues by 19 points! Robinson bombs it forward, but again the kick inside 50 is cut off by Mohr who has started well in defence. Carlton lead the inside 50s, 7 to 4. GOAL BLUESRobinson intercepts the ball & he quickly chips it over the top to Simpson who is unmanned, he lines up from the forward pocket & sneaks it home, the Blues lead by 13! Kreuzer sends a long bomb inside 50 but Mohr reads the ball well & takes the grab, the Giants work the ball out of their defensive 50 but can't get past the centre. BEHIND BLUESScotland with the massive dash from half back, he runs to the centre & sends the ball to Betts 50 out, he plays on & chips it to Walker, he lines up 45 out but tugs the kick. Green has the ball 45 out, he attempts the short pass but there is a wall of Carlton defenders to block the kick. The Blues are applying some early pressure on the Giants, their attack has been aggressive but at the moment Carlton's disposal has not been sharp. The Blues work the ball inside 50 once again however Smith intercepts, he is dragged down by Gibbs, cries for BALL go around the ground but he was pushed in the back & will receive the free. GOAL BLUESCarlton work the ball forward, Murphy has it at half forward & he sends the ball to the tip of the goal square, Kreuzer can't take the grab, it comes out to Walker who snaps & GOALS! The Giants work the ball inside 50 but the Blues are quick to rebound from defensive 50. The siren sounds, the umpire bounces it in the middle & we're underwayHampson gets first hands on the ball but GWS clear from the middle. Welcome to Etihad Stadium where flag favourites take on competition newbies GWS. We are just moments from the opening bounce.